Greenpeace today staged a protest advertising campaign on the news portal sites for The Australian and The Courier Mail. 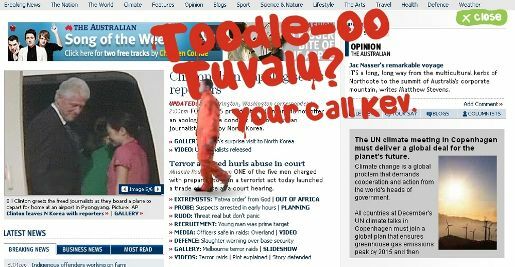 A protester walks out on to the page, sprays the words, “Toodle-oo Tuvalu? Your call, Kev. Greenpeace”. The stunt is connected to protests at the Hay Point coal point near Mackay, connecting coal export with global warming and the threat of rising waters on Tuvalu in the Pacific. 10 climbers including activists from Fiji, the Solomon Islands, New Zealand, the Cook Islands and Australia have occupied the port and interrupted operations. The online campaign was developed at Draft FCB by creative director Peter Novosel, art director Taimi Soome, and account manager Alison Ray.